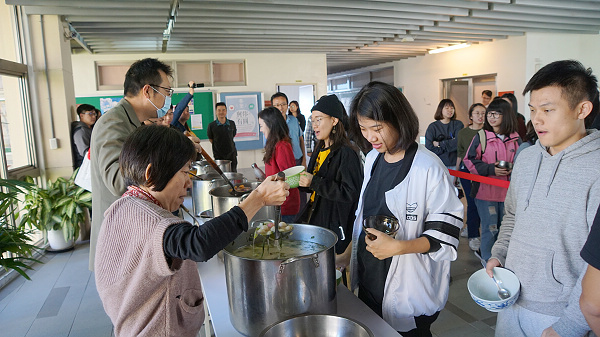 Every year around the winter solstice, yuanxiao (or known as tangyuan) will be served to students, faculty, and staff at the Lanyang Campus in order to feel the festive atmosphere of Winter Solstice in Taiwan. The Winter Solstice Event this year started at 12:10 p.m. on December 20th. 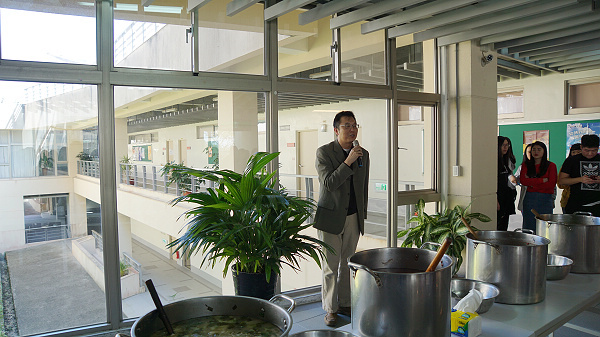 Many students had been waiting in line with their utensils ready before the event started. 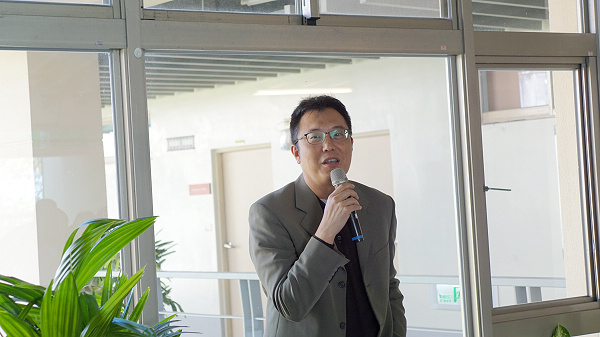 Faculty members, including the Provost of College of Global Development, Mr. Pao Cheng-Hao (包正豪院長), the Dean of Department of Innovative Information and Technology, Mr. Wu Shih-Jung (武士戎主任), the Dean of Department of International Tourism Management, Mr. Yeh Chien-Mu (葉劍木主任), and the Dean of Department of English Language and Culture, Ivy Haoyin Hsieh (謝顥音主任), kicked off the event with the distribution of tangyuans outside CL501. 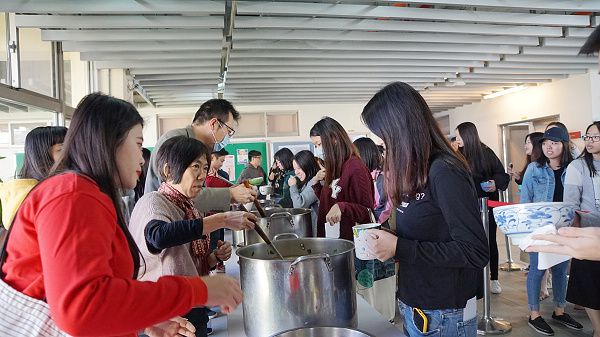 The event was co-organized by student self-governed residential social groups, Wenyuan and Chienxuan. 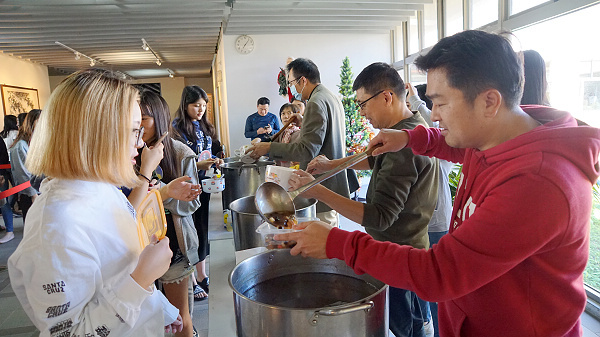 One type of savory yuanxiao and two types of sweet yuanxiao were served at the event. 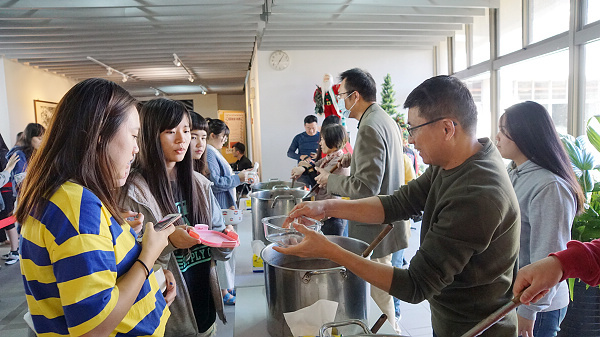 Students, faculty, and staff all enjoyed the steaming hot yuanxiao together in such a cold winter. The scene was indeed heart-warming and sweet, making the yuanxiao served taste even better. Every year around the winter solstice, the Winter Solstice Event was a must-go for every member in this big family!